All plans are tentative; all courses of action provisional. The only certainty is that the J. Paul Getty Museum is very rich, indeed. LOS ANGELES — That was the state of affairs at the world's richest museum some six years after its namesake died in June 1976, leaving $1.2 billion (about $2.7 billion in today's dollars) to "a museum, library and gallery of art for the diffusion of artistic and general knowledge." The bounty came as a surprise. Getty had implied that the Malibu museum he'd opened in 1954, modeled on a first-century Roman villa, would inherit little. So museum officials scrambled, convening brainstorming sessions on where the money should go and, in 1981, appointing Harold Williams, a former chairman of the Securities and Exchange Commission, as president and chief executive officer. Expectations exploded (The best museum money can buy! Art books too gorgeous for commercial publishers! A TV series on art!) -- and only rose some 15 months later when the Malibu museum became only one branch of the new J. Paul Getty Trust, whose interests included conservation, research, education, publishing, museum-training and grant-making. Mr. Williams soon hatched a grand plan to build a new museum-and-office complex in nearby Brentwood to house all of those activities. But the Getty Trust has never lived up to those expectations. In the '80s, even as the museum drew applause for buying trophy paintings (a Pontormo portrait for $35.2 million; van Gogh's "Irises" for about $50 million, a Manet for $26.4 million), it was reproached for driving up prices in Old Master drawings. When in 1997 the trust moved into its $1 billion, six-building hilltop campus designed by Richard Meier, critics called it sterile, overbearing and too detached from Los Angeles. Like other museums, the Getty has been forced to return many ancient artifacts to Italy and Greece and, worse, it had to watch its former antiquities curator Marion True stand trial on charges of trafficking in looted objects. It suffered the scandal of Barry Munitz, Mr. Williams's successor, whose profligate spending, fighting with staff and questionable practices led to his forced resignation. In "Loot," a book published in November, journalist Sharon Waxman devoted a chapter to describing the trust's pernicious culture, including tales of rampant sexual misconduct among staffers. Two years ago next month, Getty trustees installed James N. Wood, the retired director of the Art Institute of Chicago, to replace the ham-handed Mr. Munitz, a former university chancellor. I recently sat down with Mr. Wood, a mild-mannered 67-year-old, to talk about the Getty's promise. Mr. Wood agrees that calling the Getty an underachiever is a "fair characterization," but he wants to concentrate on the future. "We are an institution that is entering young adulthood," he says. "It's been a hell of an adolescence: rich, painful and with fighting among siblings." The past year, he points out, is the first since Getty's death that the organization did not start or build something or another. Mr. Wood says he won't be making any radical changes in the existing branches, which have been pared to the museum, the conservation institute, the research institute and the foundation. He's pleased that their leaders are a mix of two long-time hands, Deborah Marrow at the foundation and Timothy P. Whalen in conservation, and two new ones, Michael Brand, chosen as director of the museum in 2007, and Thomas W. Gaehtgens, whom Mr. Wood hired to run research. Mr. Wood intends to let them run their own shows. "What do I know about the conservation of wall paintings?" he asks. What Mr. Wood is trying to change is the Getty's milieu. He wants the four branches to collaborate and cooperate much more. "Wherever possible, we want a program in one to overlap with at least one of the others," he says. "One through four should add up to six." The Getty should be a piazza, where people share ideas, not an acropolis with temples dedicated to different cults, different gods. "I don't want to sound business-schooly," Mr. Wood says, shirt-sleeved but in a perfectly knotted tie, his blue suit jacket draped on a chair in his office a few steps away. But that's exactly how he has proceeded. Under Mr. Munitz, for example, the branch heads rarely, if ever, formally sat down and compared notes; each branch was a silo. Mr. Wood now holds Monday morning staff meetings with them, plus other top officials. Employing a metaphor for what he does, Mr. Wood says, "I create the centripetal force, as opposed to the centrifugal force." "Pacific Standard Time," an initiative to document and showcase the art made in L.A. between 1945 and 1980, is a good example of what he wants the Getty to do (although its first phase started long before Mr. Wood arrived). In 2002, the Getty Foundation funded a survey by the California International Arts Foundation of public and private archival holdings about the period, when such artists as Ed Ruscha, Judy Chicago and Ed Kienholz flowered. Discovering that many records were inaccessible and others near destruction, the foundation gave more grants, this time to libraries, museums and archives so they could keep and catalog their holdings on the era. Meantime, the Getty Research Institute began acquiring papers, videos, photographs and other records from the time. And it started interviewing important figures, capturing their voices and experiences in oral histories. In October, the Getty Foundation moved again. It gave $2.8 million in planning and research grants to 15 museums -- including the Los Angeles County Museum of Art, the American Museum of Ceramic Art, and the Long Beach Museum of Art -- that will mount concurrent exhibitions on the era beginning in 2011. Now, Mr. Wood says, L.A. performing-arts groups are talking about joining in with their own shows. Mr. Wood says that particular initiative is "not repeatable." But it shows what the Getty can do. "The Getty needs to be a catalyst for cooperation," he tells me, not saying "do this," but rather being "a convener" to inspire action by several institutions. Most of that will take place in Los Angeles, where 90% of the Getty's budget is spent. But Mr. Wood adds that the Getty is a national institution, producing scholarship and training museum leaders, and a global one, especially via the Conservation Institute, which does and disseminates scientific research and undertakes field projects all over the world. It can use this "soft power" more intensely, too. 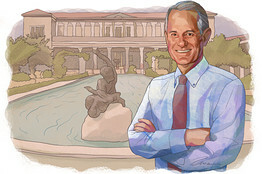 The Getty's budget for the year ending June 30, 2009, is $284 million, and Mr. Wood is the chief resource allocator, as well as the steward (with trustees) of an endowment that now totals $4.5 billion, down 25% since last June. He doesn't plan on changing the budgets for the four branches much; the museum, at $135 million this year, will get the most, and it will continue to make complementary acquisitions like last March's purchase of Gauguin's "Arii Matamoe" from a private collection for an estimated $35 million. Nor -- as some critics have suggested -- will the Getty play Daddy Warbucks for other financially ailing institutions: "The Getty doesn't have the resources available for grant-making to provide the level of support that would be needed to address the current economic problems facing all nonprofit organizations, let alone visual-arts institutions," Mr. Wood says. That doesn't mean the Getty will retrench. Mr. Wood created a new cache of money to disburse last May, at the same moment he took a stab at the Getty's "culture of affluence." He announced a cost-cutting program, eliminating 114 jobs and trimming programs. The savings, a "flexible" fund of more than $35 million a year, are intended to pay for new strategic initiatives. All of this may seem too staid for some of those who've been disappointed by the Getty before. In Mr. Wood, trustees hired a modest man with a steady hand, not a visionary with an ingenious plan. They must have figured the Getty needed settling down more than shaking up. They may be right.